Williams Advertising was awarded the Chamber’s Quality Service Award in December 2016. With a family history of entrepreneurship, a background in sales with his previous company, Williams Chevrolet, and time spent with the Vernon Company, Doug Williams began promotional products company Williams Advertising in 1985. In 2015, granddaughter Sarah Whitaker joined Williams and leads the growth of the promotional products sales division, as well as started the marketing division of the company. Son-in-law Freddie Wells also joined sales in 2015. Phyllis Groves is the bookkeeper for Williams Advertising. 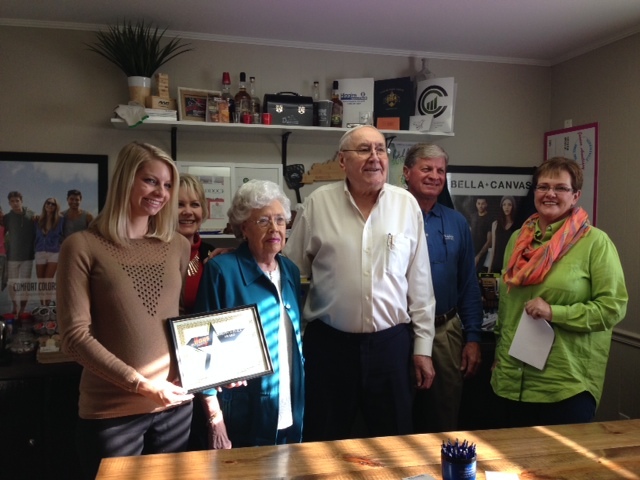 For over 30 years, Williams Advertising has been Hopkinsville and Christian County’s promotional products distributor. Now the company has grown to serve customers nationwide. In addition to corporate branded products, Williams Advertising offers custom-designed screen printed and embroidered apparel. Marketing strategy, website design, social media and content management, advertising creation and management, graphic design, and events all make up the services the marketing division of Williams Advertising offer. We are proud to offer ever-changing services to help our local businesses grow and adapt to market changes, and we look forward to continued growth in the coming years! We’re so grateful to our customers for shopping local and allowing us to do what we love. We’re also very appreciative for this recognition as Quality Service Award winner from the Chamber and Herb Hays.